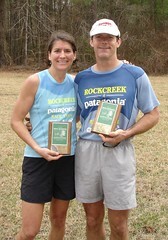 We wish Rock/Creek Race Team members, Randy Whorton and Kris Whorton safe travels as they head to Colorado this weekend for the Rock ‘n’ Roll Denver Marathon & Half Marathon. This race marks the celebration of Randy’s 100th Marathon. He and his father ran this race as their first marathon, nearly 30 years ago. It was special enough to inspire both of them to make running a significant part of their lives! The list of 100 events includes seven 100 mile races, a 219 mile 7-day event, a 184 mile 7-day event, thirty-six 50ks, five 50 milers, forty-five marathons, and zero injuries. We wish Randy luck this weekend in his meaningful celebration!